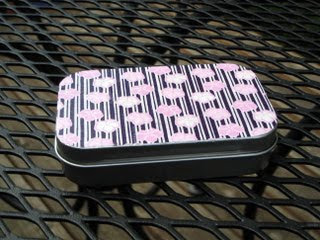 Supplies: You'll need an Altoid tin, some origami or scrapbook paper (I like origami as it's a bit thinner and you get several patterns for your buck), and some Mod Podge. (I used the Gloss for a lacquer finish.) 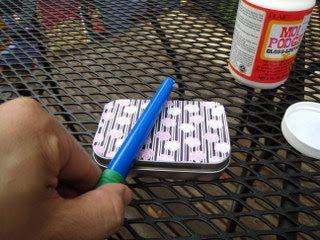 You’ll also need a pen or pencil, scissors, & a paintbrush or foam brush for the Mod Podge. 1. 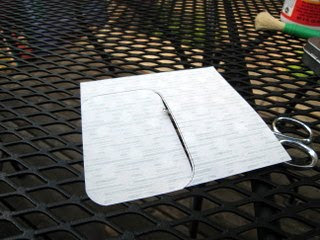 Use the lid of the tin for tracing your piece of paper. 2. 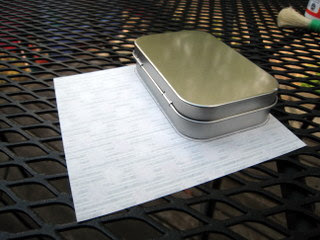 Cut inside your guide line so the paper doesn’t hang over the edge of your tin lid. 3. 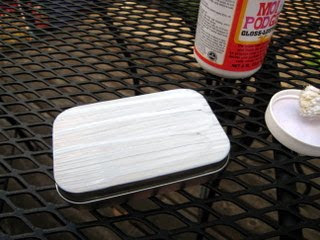 Brush a moderate layer of Mod Podge onto the tin lid and place the paper on. 4. Use the brush handle to smooth out any bumps. 5. 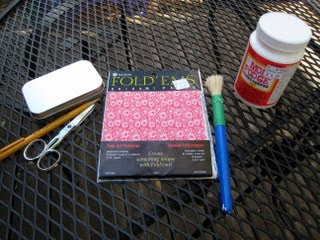 Place a thin layer of Mod Podge on top of the origami paper to seal. Voila! 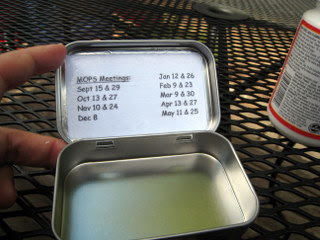 For our group, we added a business card with all the MOPS meeting dates for the year, so we repeated the process inside the lid. At the meeting, we also realized we had enough paper to do the inside bottom, so we added a bit more pattern there. Didn't get the picture of that step, though. Hope you enjoyed my first tutorial for the craft-challenged! Very cute! 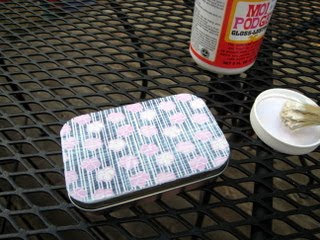 I love love love altering stuff and have done several Altoid tins. I made one for girl's night out with essential touch up makeup. I did one for my mom and put a little mini picture album in it. I have one in my purse with my spare contacts, some eye drops, and a mirror glued on the inside of the top. I could go on and on! Anyway, I think yours turned out cute! Great idea! I'm thinking of doing one with a few things for my kids to keep in my purse. Maybe a few small crayons & some paper to keep them entertained. Aren't there so many uses for them? Fun!